Now having skied another week on the bike I began to think through the detail a bit more, were my original thoughts still valid. Let’s take the first, long travel. 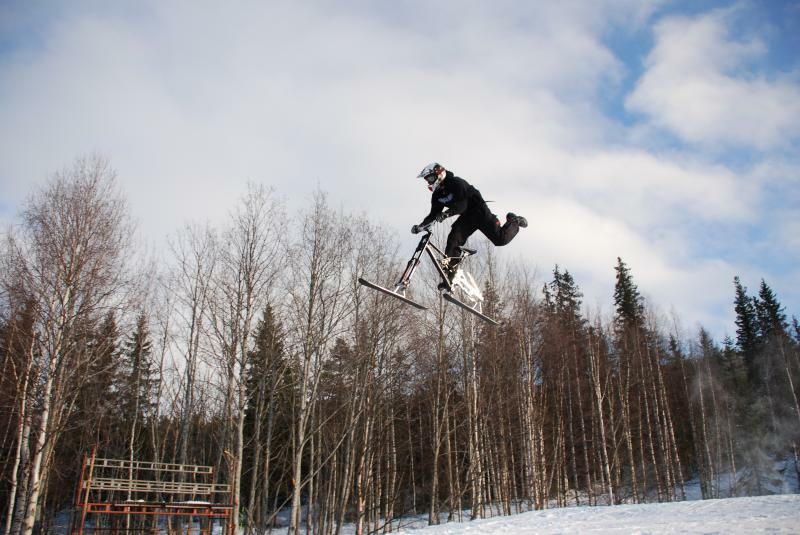 Get over it guys you simply do not need long travel ski bikes other than to get all the bits in the right places to get ground clearance and head angles correct or you intend on doing a lot of jumping. Mine has about 5 inches ( 125mm ) of travel back and front, using the old favourite tie clip around the shock , total travel was never more than 75mm front and about the same at the back. Experimenting about a bit with shock pressures and ride heights ( I can adjust the ride height at the back ) there is a sweet spot where the bike seemed to want ski nicely and yet the travel was becoming stiff and yet still supple. In reality probably only a well damped 75mm is enough after all most slopes are groomed for skiers without suspension or powder where you tend to float far from the surface and suspension certainly is not needed. Do we actually need suspension, yes as it helps with the mechanics of getting the ski to change edges and the likes. Much more on this subject soon. The other factor of extra suspension travel is ride height, the more travel the higher the COG. I built a slightly longer set of ski mounts, only about 25mm more but you really could tell the extra height in the way the bike responded. Get that COG down as low as you can, my pegs are about 100mm off the deck with the usual 1/3 pre-travel ( just the riders weight ) and yet doesn’t seem to bottom at any stage and with the ski pegs just beginning to dig in on the inside on steep terrain turns. Low as you can guys so that with full suspension down, you should just be clear of the ski. Low COG is important also to be able to go from one edge of the ski to the other in carved turns, lower COG means less roll time from edge to edge. OK next, clearance for the chairlift to pass over. The whole ergonomic thing of the bike fitting the lifts is just so important, the lifts were designed for a whole different clientele, we have to fit in with them, not the other way around. The Lenz, Bull Skate and my design all have that common low swing arm height. 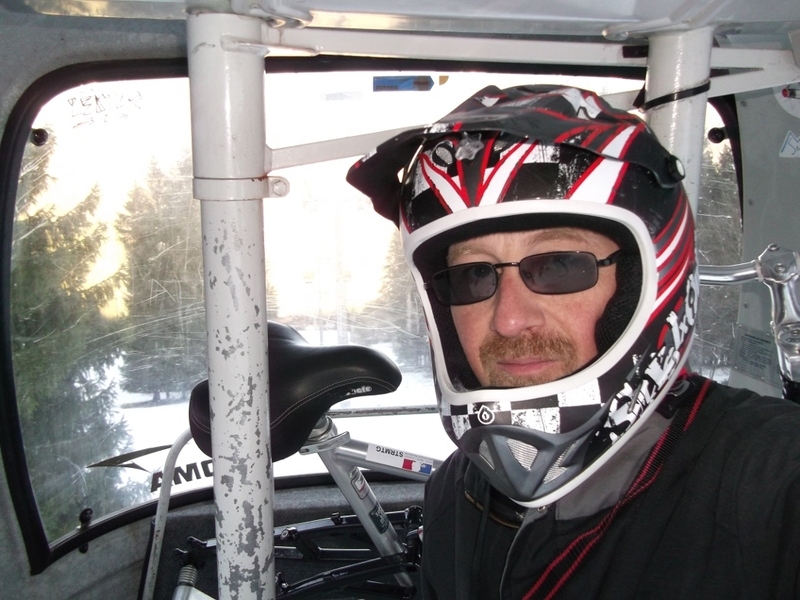 It pays hugely on chairlifts where you can simply ski into the pickup point astride, sit on the chair and pick the bike up with your feet under the pegs holding the seat, pull the safety bar down, clip the seat over the bar and both you and the bike are on and safe. If you have large levers and the likes poking out the back then this just is not going to be possible. Even more important is how do you dismount if you are not astride the bike, probably run as fast as you can, with a properly fitting bike, it’s simply hold the bike up with your feet until the skis touch the snow, one foot on one peg, launch yourself onto the bike and give a scoot with the other foot. Incidentally the Y frame has another benefit, plexiglass covers that can be pulled down over the skiers for element protection are now the fashion in most modern lifts, the bottom lip of the covers sits as neat, as though it was designed, into the top recess of the Y. Bubble lifts are another ergonomic thing to think about. On this last trip we skied at a number of older smaller ski areas where the old fashioned tiny 6 man bubbles were still being used. I could only get my bike in if I had my front ski totally vertical, now most ski adaptors on the market cannot do this due to a spring arrangement or travel limiter. I’m really not sure, unless you are going to jump the bike, that you really need to centralise the ski. Skiing in powder is the only time that I have dug a front ski under and that was probably because my technique in powder at the time was experimental to say the least. I only have a simple bungee pulling in one direction to ensure the ski stays pointing up for getting off chairlifts. Weight is important as you will end up lifting the bike over lift entry gates and you will need to carry it to and from your accommodation. Before finalising your bike build, weigh all the bits and if it totals more than 10 kilos then think again. 10 kilos is enough by the end of the day to be lugging about and looking after on lifts. We came across a Pegger ski biker in Austria, he was riding a Klien down hill bike with the weirdest rear suspension hanging out the back, the longest front forks I have seen, the tallest ski mounts you could imagine, on 800mm skis, and with all the home made bits and pieces, weighed in at 18 kilos. Being a tall guy as well, the whole set-up just looked sooooooo wrong. To top it off the bike wouldn’t fit onto the chairlifts other than getting the liftie to place it on his lap. I wish him well but that was not a good set-up. That afternoon we were skiing along and looked through some small trees where we could see a head moving along the top of the trees, kid you not but Giraffes and the Serengeti immediately came to mind. OK that’s a bit to digest for the moment, what about ski types, handlebar heights, suspension settings, what sort of foot ware, there is loads more to talk about, we’ll stop here and call this Part 2. More soon.